Diese Studie erhebt die Anzahl der Publikationen und deren Zitierungen von Universitätskliniken für Anästhesiologie in Deutschland, Österreich und der Schweiz (D-A-CH) und vergleicht sie mit Ergebnissen aus D‑A-CH von 2001 bis 2010 und anderen aktuellen Studien. Durch eine automatisierte Auswertung von PubMed wurden alle Publikationen zwischen 2011 und 2015 anhand des Autorenfeldes eingeschlossen, falls einer der Autoren einer Universitätsklinik für Anästhesiologie in D‑A-CH zuordenbar war. Es wurden die Anzahl der jeweiligen Originalarbeiten und mit Thomson Reuter’s ISI Web of Knowledge die Zitierungen erhoben. Die 47 Universitätskliniken für Anästhesiologie veröffentlichten 4697 Publikationen (davon 3709 als Erstautoren, 79 %), was einer universitären Beteiligung von 89 % bei anästhesiologischen Publikationen in D‑A-CH entspricht (insgesamt 5284 Publikationen). 1037 Publikationen (22 %) waren Originalarbeiten (davon 821 als Erstautoren, 79 %). 90 % aller Publikationen bzw. 96 % aller Originalarbeiten wurden bereits mindestens einmal zitiert. Die Universitätsklinik Zürich veröffentlichte am meisten Publikationen (n = 245), Wien am meisten Originalarbeiten (n = 77). Den höchsten Anteil an Originalarbeiten erzielte Wien (37 %). Publikationen aus Berlin – Benjamin Franklin und Jena (11 Zitierungen/Publikation) sowie Originalarbeiten aus Essen (23,5 Zitierungen/Originalarbeit) wurden am häufigsten zitiert. Im Gegensatz zum weltweit steigenden Trend stagnierten die Publikationszahlen der Universitätskliniken aus D‑A-CH. Der Anteil von Originalarbeiten an Publikationen ist wie bereits 2001–2010 rückläufig (−6 %). Größere Anstrengungen sind erforderlich, die akademische Arbeit in der Anästhesiologie in D‑A-CH zu fördern. Die Online-Version dieses Beitrags ( https://doi.org/10.1007/s00101-019-0582-2) enthält zwei weitere Tabellen zur Jahresaufstellung der Anästhesiologie-Publikationen von 2011 bis 2015 und den Zitierungen von 2011 bis 2015 von Anästhesiologie-Publikationen. 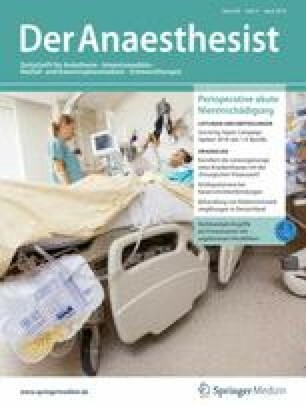 Beitrag und Zusatzmaterial stehen Ihnen im elektronischen Volltextarchiv auf http://www.springermedizin.de/der-anaesthesist zur Verfügung. Sie finden das Zusatzmaterial am Beitragsende unter „Supplementary Material“. This study presents a count of publications and citations for all articles published by university Departments of Anaesthesiology in Germany, Austria and Switzerland between 2011 and 2015. The results were compared with former analyses of these countries from 2001–2010 as well as similar international studies. We performed a PubMed search based on PERL-scripts for all publications originating from university Departments of Anaesthesiology in Germany, Austria and Switzerland between 2011 and 2015. According to their author’s affiliation, articles were assigned to their affiliated university department. Publications were considered an original article if the category of publication was classified as original research in PubMed. Predatory journals were omitted by using PubMed-listed journals only. Data of citations was retrieved from Thomson Reuter’s ISI Web of Knowledge. The following indicators were reported: the number of publications and original articles (counting each author and first authors only) and the share of original articles out of all publications. With regard to citations, we reported the overall number, the percentage of publications, which were cited at least once and the median of citations per publication and per original article as well as the calculated h-index. The 47 university Departments of Anaesthesiology published 4.697 articles between 2011 and 2015, which make up 89% of all anaesthesiology research originating from Germany, Austria and Switzerland (overall 5.284 publications). Of these, 1.037 (22%) were classified as original articles. Considering only articles with first authors, equalizing a change of PubMed’s affiliation field policy in 2012 to compare the numbers with previous periods, 3.709 publications and 821 original articles were published. 90% of all publications and 96% of original articles, respectively, were cited at least once. Publications were cited six times, while original articles were cited nine times. The university department of Anaesthesiology in Zurich published most (n = 245), while most original articles were published in Vienna (n = 77). The highest share of original articles was achieved by Vienna (37%). Publications from Berlin – Benjamin Franklin and Jena (11 citations per publication) and original articles from Essen (23,5 citations per original article) achieved the highest citation rates. In contrast to the worldwide increasing trend, the number of publications of the university Departments of Anaesthesiology in Germany, Austria and Switzerland stagnated. The share of original articles out of all publications continues to decline in comparison to 2001–2010 (–6%). Despite this, original articles were cited more frequently and thus had a higher value for the scientific community. The reasons of the decrease in the number of original articles remain unclear and require further investigation to reverse this negative trend. Strategies to foster academic work in anaesthesiology in Germany, Austria and Switzerland are required. C. Miller, J. Ausserer, G. Putzer, P. Hamm, H. Herff, V. Wenzel und P. Paal geben an, dass kein Interessenkonflikt besteht.